Today, we had the chance to meet with the New Haven bomb squad! 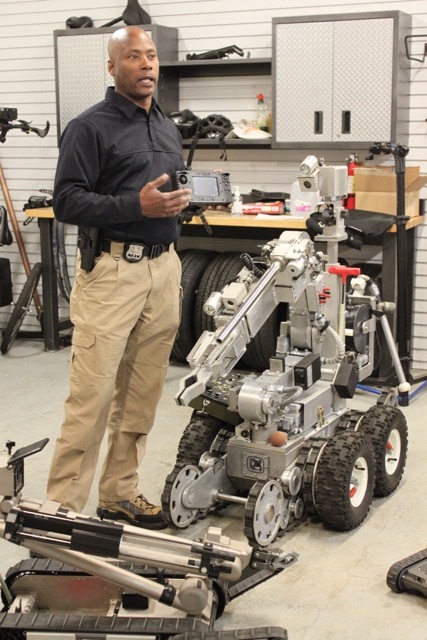 Three of the officers, Rosa Melendez, Charles Hebron and Jason Salgado, showed us their three robots that are used every time they go on a call. They told us about the robots purposes, and we even got to drive them! 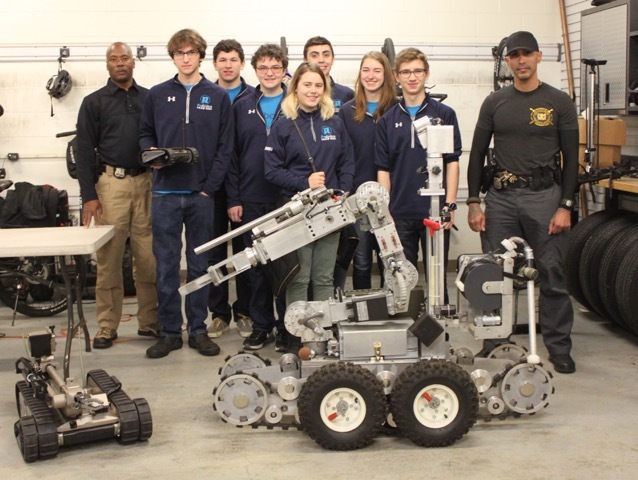 i²r and the New Haven Bomb Squad with their robots! The biggest robot can preform many tasks, including climbing stairs, heavy lifting, and blowing up bombs. It holds 140 mL of water, and disables a potential bomb with the attached water cannon. It's certainly sturdy, and can take a beating. This robot is especially useful because it can move packages to a safer area before destroying it, allowing the officers to multitask. The medium-sized robot has two lasers to aim, and an arm that can extend very far! The smallest robot, which is mostly used for inspecting packages, is extremely durable. It has the ability to continue working even after being thrown out of a building. We were all surprised when one of the officers threw the robot across the room and it was still fully functional! We gave a brief explanation about FIRST, FTC and our team. Greg showed them a video of our robot from last year, and they examined our engineering notebooks! 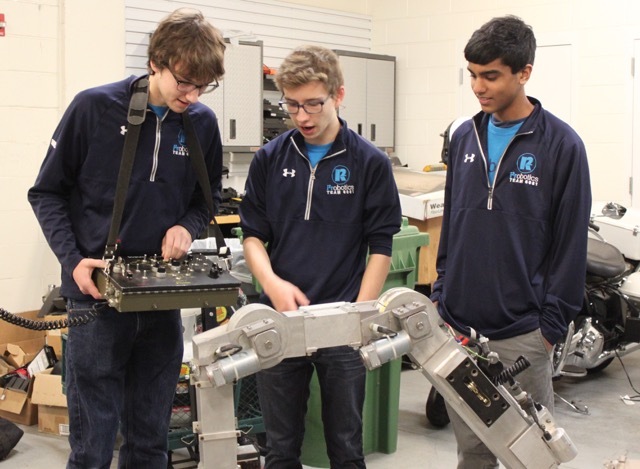 We also told them about one of our alumni who created the Smith's Bot, a robot built at Smith's detection using an ACE ID. 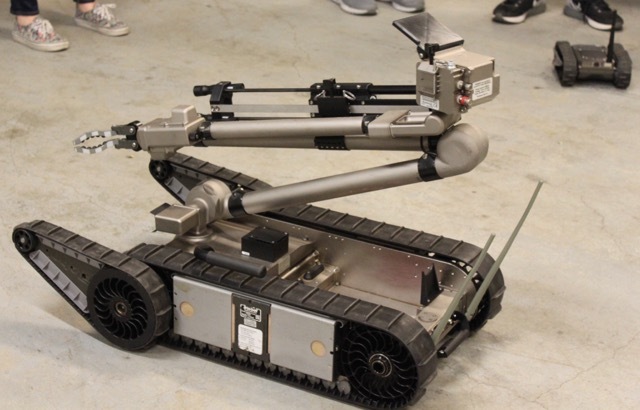 It's similar to some of the robots the bomb squad uses, and they seemed interested and impressed with the work! The bomb squad allowed us to drive the robots, which was an absolutely incredible experience! We experimented a bit by picking up bottles of water with the robot and handing it to the other. It was a truly inspiring day, and we hope to see the bomb squad again! Ben, Luke and Neal driving the biggest robot! 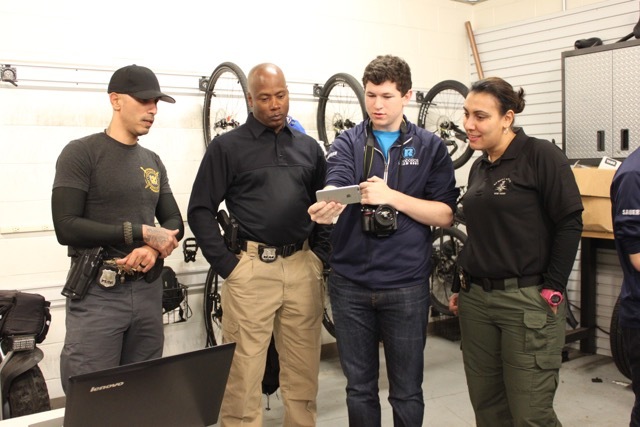 Thank you so much, New Haven Bomb Squad, for meeting with us, especially Officer Jason Salgado, who helped coordinate the event!